Atlanta Streets Alive will return to Southwest Atlanta on September 29, 2019! In addition to asking the City to fund and build safe streets, our 2019 Atlanta Streets Alive program is mobilizing community support for safe streets by raising awareness of Atlanta’s High-Injury Network — on which six out of the 10 streets with the highest rate of serious injury and fatal crashes are located west of Northside Drive and south of Martin Luther King Jr Drive. All streets in our city should be safe for all people. Safe streets improve connectivity to transit, healthcare and other services, social and recreational destinations, jobs, and schools. Safe, complete, and inclusive streets call for community involvement — that’s why we are asking the community members of Southwest Atlanta to help us select an Atlanta Streets Alive route that will inspire residents to seek the transformation of Atlanta’s High-Injury Network streets into livable, accessible, and equitable public spaces that strengthen and connect our communities with opportunities to thrive. Please take this quick, five-question survey, and share it with others who live or operate a business in Southwest Atlanta. The survey is open until Wednesday, March 13th. Author adminPosted on March 2, 2019 Leave a comment on Atlanta Streets Alive will return to Southwest Atlanta on September 29, 2019! Join us for our monthly meeting for residents of Neighborhood Planning Unit V! 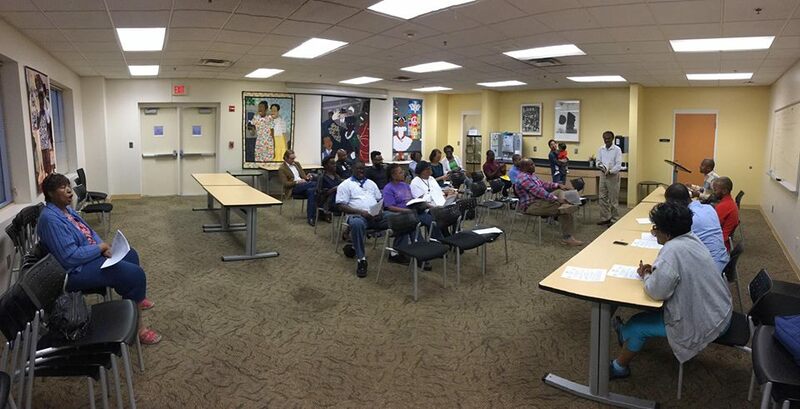 The City of Atlanta is divided into 25 Neighborhood Planning Units or NPUs, which are citizen advisory councils that make recommendations to the Mayor and City Council on zoning, land use, and other planning issues. 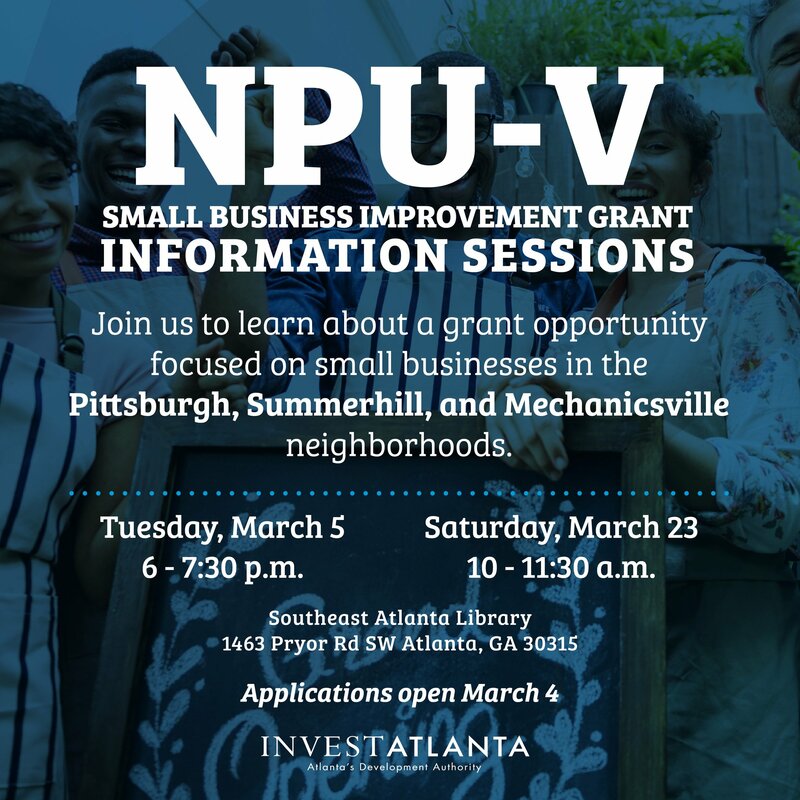 NPU-V encompasses the communities of Mechanicsville, Summerhill, Peoplestown, Pittsburgh, Adair Park, and Capitol Gateway. 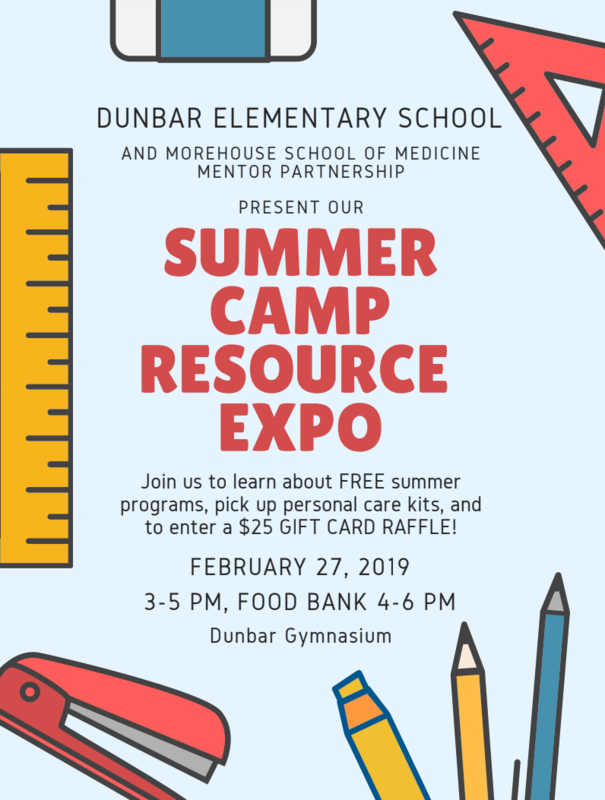 The host community is Mechanicsville and the meeting will be held at Dunbar Recreation Center (477 Windsor Street SW Atlanta, GA 30312). The meeting agenda will be added once it’s published. Mechanicsville Civic Association Meeting on Monday! Please join us for our monthly Mechanicsville Civic Association meeting, Monday, March 4th at 6:30 PM. The meeting will be held at Dunbar Recreation Center (477 Windsor Street SW). 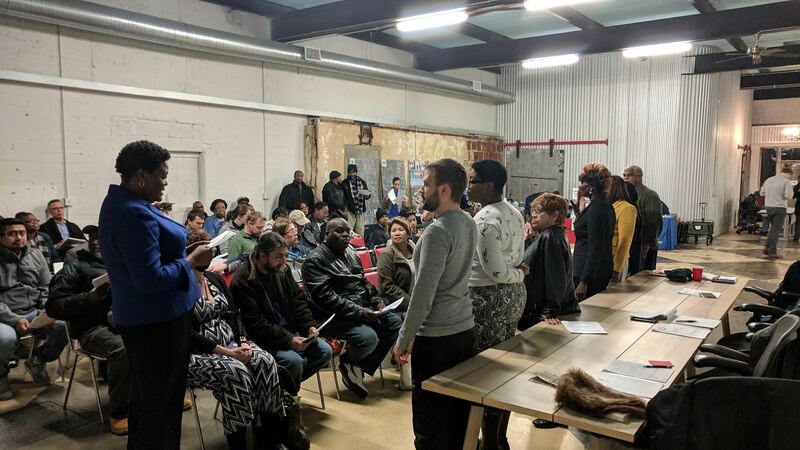 Author adminPosted on March 2, 2019 Leave a comment on Mechanicsville Civic Association Meeting on Monday! Just a head’s up in case you didn’t notice, but there’s a Neighborhood Events calendar on the sidebar of our website. The calendar not only includes official Mechanicsville Civic Association events like meetings, but it also includes filming notifications (and attachments) and any events we get from our partners and friends. Check it out at our website! You can also add this to your personal calendar by pressing the “+” sign at the bottom right. Councilmember Sheperd, who chairs the Code Enforcement Commission and Sub-Committee wants to share with you the Flyer introducing the newly formed Code Enforcement Academy. The Academy will take place in five sessions occurring every other week beginning March 16, 2019 and ending May, 11, 2019. Participants will receive certificates at a graduation ceremony at the City of Atlanta. Applications are open to all Atlanta Citizens. Councilmember is encouraging all NPU Leaders to share this information with your community members. Our application committee will select from a cross section of the city bas there are only 50 slots open for our first class. We are hoping you have one or two person in mind to recommend for the inaugural class. If so please share the attached application with them. We will have a second session in the Fall 2019 and beginning in 2020 the Academy will have three sessions per year. Purpose: Implementation of a code enforcement training academy to empower City of Atlanta residents with knowledge surrounding code enforcement and the law through various departments. 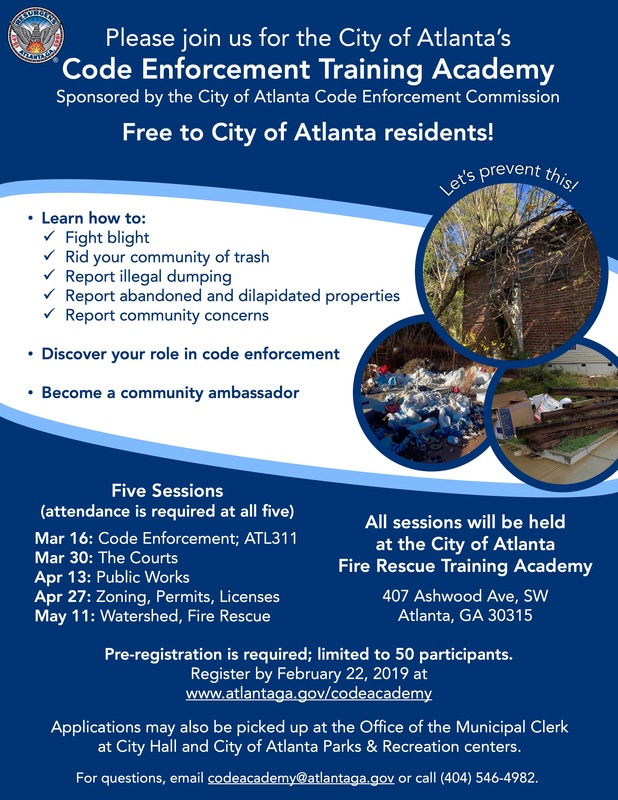 “The City of Atlanta Code Enforcement Academy” program will provide participants with knowledge of core job functions through classroom instruction and educate members of the community on organizational structure, premise violations, substandard structures, 3-1-1 overview and community partnerships. Our neighbors in Summerhill have a storied past. A number of Atlanta’s most renowned leaders, celebrities (think Super Bowl 53 & Gladys Knight) and athletes grew up there. Its story is a unique one, and its history provides a window to the way Atlanta was and perhaps, the way it will be. So, If you live here, are a long time or new resident, are thinking of living here or just interested in stories about historic Atlanta neighborhoods, you’ll want to check out http://bit.ly/GeorgiaAveATL. It’s a wonderfully done history of 20th century Summerhill by Dr. Marni Davis of GSU, with support and partnerships from myself, Annie E. Casey Foundation, Summerhill Neighborhood Development Corporation, Carter USA, Georgia State University, and the Atlanta History Center. Please have a look, share your thoughts and thank you! Public exhibition to follow—stay tuned!